Darius Kellner speaks better Klingon than Farsi, and he knows more about Hobbit social cues than Persian ones. He's a Fractional Persian—half, his mom's side—and his first-ever trip to Iran is about to change his life. Darius has never really fit in at home in Portland, and he just knows things are going to be the same in Iran. His clinical depression doesn't exactly help matters, and trying to explain his medication to his grandparents only makes things harder. Then Darius meets Sohrab, the boy next door, and everything changes. 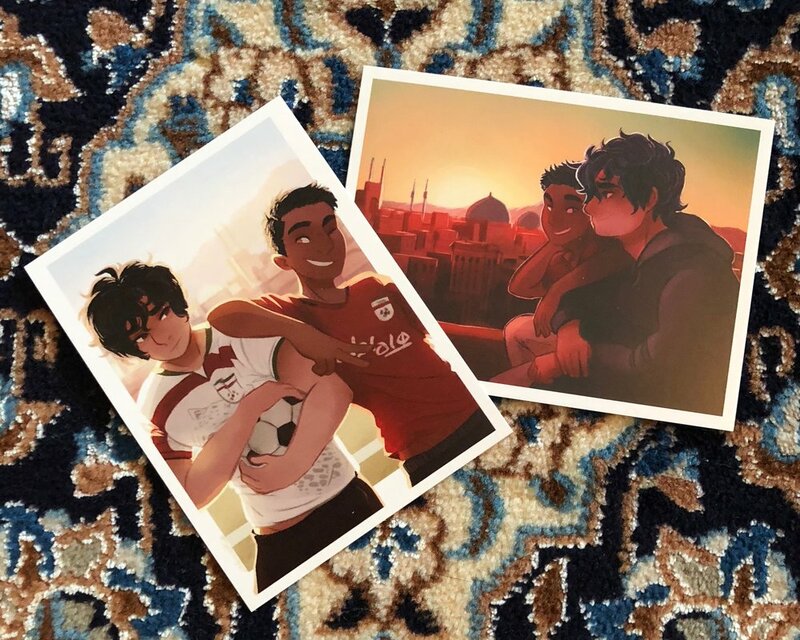 Sohrab introduces Darius to all of his favorite things—mint syrup and the soccer field and a secret rooftop overlooking the city's skyline. He gets Darius an Iranian National Football Team jersey that makes him feel like a True Persian for the first time. And he understands that sometimes, friends don't have to talk. Sohrab calls him Darioush--the original Persian version of his name—and Darius has never felt more like himself than he does now that he's Darioush to Sohrab. Wonderarium, creator of the webcomic Out of the Blue, created some fantastic art for DARIUS's preorder campaign. It might make an appearance at festivals and such if you missed it! Cover design by Samira Iravani. Cover illustration by Adams Carvalho. Banner photo © Afsoneh Khorram. Photos of Yazd courtesy the Khorram family.